Camshafts may be identified by a ground land just forward of the No. 3 bearing journal. The land may have one (1), two (2) or no grooves depending on model, year and series of car, as indicated below. See Figure 1. In order to improve engine ventilation, a change is being made in the rocker arm cover and the valve push rod cover. The present oil filler tube and cap are being removed from the valve push rod cover, and a new valve rocker arm cover is being released which includes provisions for a new oil filler cap to be mounted on the top of each cover. The new oil filler cap used is the same part as was previously used on the straight eight engines. When these changes are made, the crankcase baffle is eliminated. For service replacements, the new rocker arm cover will be used for all replacements of the old, when stock on hand is exhausted. When installing the new cover on an engine which had the 1st type cover, it will be necessary to install the new oil filler cap. Both types of valve push rod covers will be available for replacement purposes, along with the 1st type oil filler cap. The oil filler tube extension and hose used on 1st type air conditioner cars will still be available for service replacements. If, for any reason, an owner is desirous of having this change incorporated in a car with the first type vent, it will be necessary to replace the parts as outlined in above par with the exception of the valve lifter cover. The old valve lifter cover is usable with only one modification, that being to plug the oil filler tube so that no dirt or air can enter through it into the crankcase. Under no circumstances should holes be drilled or cut in the original rocker arm covers. We have been advised by our Engineering Department that it is no longer necessary to measure the hydraulic lifter ball travel in the field. We do not find where any measurement of the ball travel on lifters was outside of production limits; therefore, hydraulic lifter ball travel measurement should be discontinued. Due to the high heat of the spark plug insulator under severe driving conditions, the spark plug boots tend to harden and crack after use. In this hardened condition, they can no longer control the ignition voltage and may cause missing; therefore, they should be replaced. In general the spark plug boots will outlast one set of spark plugs, but they will not outlast two sets of spark plugs. Owners should be encouraged to replace spark plug boots, Gr. 2.272, Part # 1162142, at the same time spark plugs are replaced to prevent early failure. It has been brought to our attention that some missing is being corrected by cutting the end off these hardened spark plug boots. This is only a very temporary “fix” as it only gives a little added clean insulator below the tip of the boot. As soon as dirt and moisture collect on this surface, missing will again result. This practice should be eliminated. The wiring arrangement should be checked to the 1954 and 1955 Shop Manual to preclude the possibility of pre-ignition. Determine whether oil consumption is acceptable. If not, correct. Check initial distributor setting. If it isn’t set at 5° advance, reset to this figure. Check to see if centrifugal and vacuum advance of distributor falls within the limits specified in the Shop Manual. Also, check distributor for dwell angle variation. Dwell angle should not vary more than three degrees total between idle speed and 1500 R .P.M. Follow the manufacturers’ recommendations for calibration and use of the dwell meter. Do not exceed 1500 engine R.P.M. as some dwell meters are not accurate at high speeds. Make sure fuel is of the highest octane that can be conveniently purchased. If the above changes don’t seem to bring the octane requirements of the engine within the fuel range the initial spark setting may be retarded to T.D.C. without any noticeable loss in car performance or economy. If the previous step doesn’t make the car passable, then carbon blast the chambers in exact accordance with the operating instructions accompanying each Kent-Moore “Head -On” Carbon Blaster. The above procedure may be used effectively on 1954 and 1955 engines; however, if after performing the above procedure on a 1955 model and it is not made passable, then contact the zone office for further instructions. 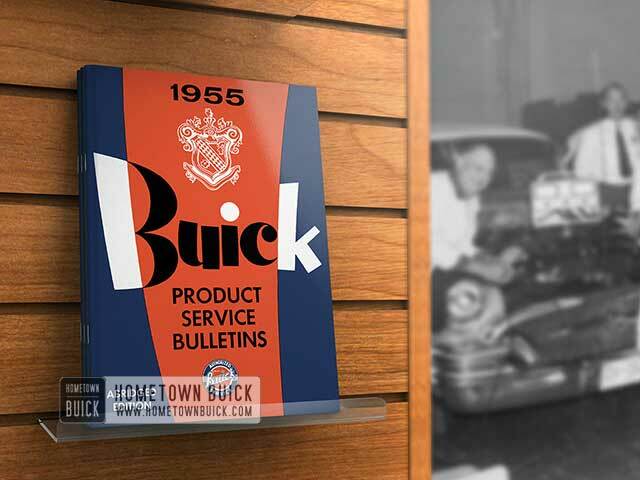 Exhaust leaks have been reported to exist between the cover and bottom of intake manifold on 1955 after jobs, including cars having the new after- job carburetor and intake manifold which has exhaust gas passages leading to the carburetor mounting flange. The leak can be eliminated by removing the intake manifold cover, applying #1 ”Permatex” (grey permanent type) to the sealing edge and reinstalling the cover. 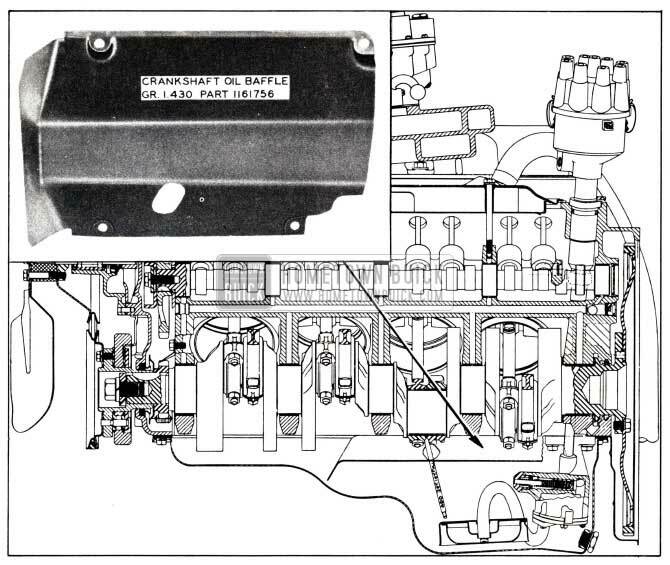 A few exhaust leaks have also been reported on 1955 after- jobs equipped with 2-barrel Carter Carburetors. On this carburetor, the two mounting holes in the throttle body are drilled through the exhaust passage, making it susceptible to leaks at the mounting studs, especially if the surface around these holes is not machined so that the carburetor attaching nut does not provide an effective seal at these two (2) locations. Whenever this condition is encountered, it is suggested that the high spots be filed or ground down to obtain a good flat sealing surface. Also, a standard SAE 5/16″ nut, having a larger diameter hex may be used as a replacement for the present special nut which has a smaller diameter. The use of a larger diameter hex nut will insure a better seal at this critical point. #1 “Permatex” (grey permanent type) may also be used at this location. We have received several reports that a bearing noise was present immediately after starting an engine which has not been in operation for at least 30 minutes. 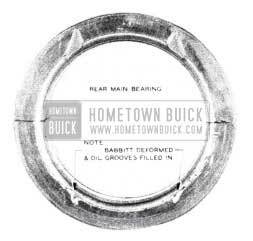 In each case the bearing noise lasted up to as high as 10 seconds and was accompanied by a lack of oil pressure. It was also noted that the noise disappeared when oil pressure developed as indicated on the gauge. Engineering is familiar with this condition and have found that in most cases the cause of this knock is due to excessive bearing clearance. The average time for a satisfactory engine to develop oil pressure after making a cold start is between 2 and 4 seconds. Therefore, we might suggest that the bearing clearance be checked on such complaints and try installing undersize inserts where the clearance is found to exceed .0025′ ‘. Recently it was brought to our attention that a broken thermostat spring on the exhaust manifold heat control valve was diagnosed as a bearing noise. This broken spring allowed the heat control valve counter weight to be thrown against the exhaust manifold or heat control housing causing a noise similar to that described above as bearing noise. It is suggested that this be checked before proceeding further in cases diagnosed as bearing noise. Our Standard Research Department recently published a report in which it recommended using an Oakite #33 solution for cleaning rusted and stuck hydraulic valve lifters. This solution is prepared by combining equal parts of Oakite #33 and water (hot or cold); hot water may be used to increase the cleaning action of the mixture. If this type solution, is used continuously, it is advisable to use rubber gloves to prevent the hands from contacting the liquid as it tends to dry the skin and cause irritation. 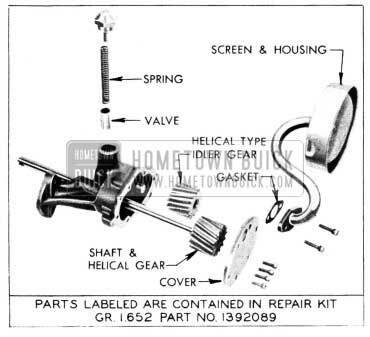 The same general procedure outlined in the 1955 Buick Shop Manual, page 2-73, paragraph 2-15, may be used for servicing hydraulic valve lifters; however, when Oakite #33 solution is used for cleaning lifters, do not soak spring or plunger retainer any longer than necessary as these parts may become etched with a resulting stress concentration in the spring. After lifter parts are soaked in the Oakite solution, they should then be thoroughly rinsed in lukewarm water and completely dried, then dipped in lifter test fluid before assembling. Note: The lifter will have some discoloration after it is cleaned in the solution; however, this does not seem to effect lifter operation. Oakite may be purchased from: Oakite Products, Inc. Spur type oil pump gears have gone into production and will replace the helical type gears previously used. See Figure 2 & 3. The new Spur type gears are made from powdered metal which is compressed under extremely ‘high pressures,, then subjected to extremely high temperatures causing the powdered metal to fuse together and form the gear, thus eliminating extensive machining originally required. This type of gear requires a tighter press fit on the drive shaft than the helical type, consequently, the bore size of the new spur gear is slightly smaller than the bore in the helical gear. For this reason the diameters of the spur gear idler pin and its mounting hole in pump body are also smaller than those used with the helical gear. Because of these differences between pin and hole sizes, the Parts Department is stocking two oil pump repair kits; one kit, Group # 1.652 Part # 1392089, is for an oil pump equipped with helical gears and another kit, Group # 1.652 Part # 1392461, is for a pump equipped with spur type gears. 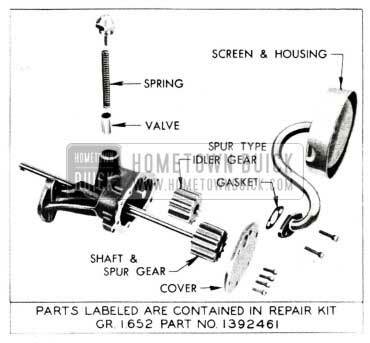 All parts labeled, except the idler pin, are included in repair kit as indicated in Figure 2 and 3. Under no circumstance should one type of oil pump gear set be replaced by the other type. Since oil pump parts are very slow moving items, only the complete oil pump assembly and the two types of repair kits mentioned above will be made available for service. It was found that the installation instructions printed on the Oil Ring Box in the Service Piston Ring Sets are not complete and these will be changed as soon as possible. To properly install the Oil Rings in the sets you have on hand and which are in our warehouses, the following instructions should be used. We have received a few complaints where one thrust face on the rear main bearing is worn. The thrust face appears to be worn excessively since the Babbitt deforms, flows, etc., whereas the actual dimensional wear is perhaps less than .003. See Figure 4. While the condition is not desirable nor serious, it is felt that all service personnel should be informed of its existence, its cause and a method of correction and prevention. The condition where the thrust face is worn only on one insert is due to misalignment of the rear main bearing cap. Since there is no positive alignment of the rear main cap at assembly, the thrust faces can be out of line by the amount of clearance between the thrust faces and crankshaft journal. (.008 maximum). Assemble crankshaft and all main bearing caps leaving rear main cap bolts loose. Use a bar or wedge and force crankshaft as far rearward as possible (this aligns front thrust faces if they were not in line since cap and bearing are free to move axially). Repeat Step #2, forcing crankshaft as far forward as possible (this will align rear thrust faces). While holding crankshaft in the forward position tighten rear main cap bolts so cap cannot shift position. The above procedure should align thrust faces satisfactorily to prevent this condition. Following is a reprint of Special (Red Band) Service Letter Dealer No. 158, dated May 5, 1955. A few field complaints have been received where connecting rod bearings, and in majority of cases, main bearings were “burned out”, and investigation by the dealers revealed no apparent reason for cause of failure. Oil level was satisfactory (between full and two quarts low); nothing in the oil pump assembly, such as stuck pressure relief valve, plugged screen, etc., which could have caused this condition. 1953 or 1954 V -8 Model. Dirty or plugged oil filter element. Driver must perform rapid deceleration from high speed and keep engine running. Condition aggravated by low oil level. Some types of oil filter elements on the market today will contribute to this condition even when they are new. NOTE: Some type oil filter elements when new (other than those recommended by the factory) have an internal resistance requiring more than 6 lbs. of pressure to force oil through them. The obvious solution to the problem is to keep the factory recommended oil filter element changed regularly at 5,000 mile intervals, or even more frequently in dusty areas. It should also be performed on any 1954 Series 40 engine having a number lower than 6182734, and any between 6227994 and 6265814. 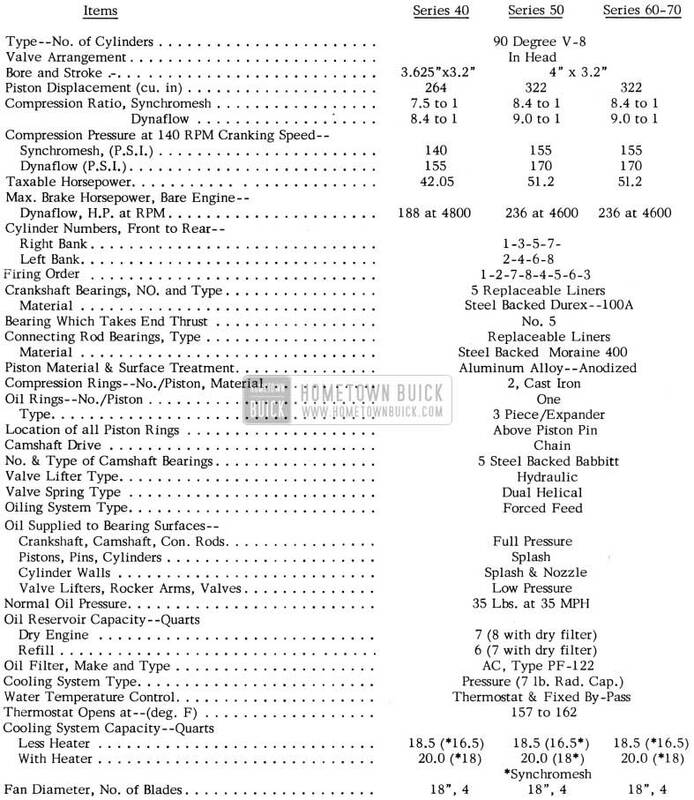 NOTE: All 1954 Series 60, 50 and 70 engines having higher numbers than those listed above (including those listed) and series 40 engines having numbers between 6182734 and 6227994 will have the type oil screen and housing assembly used in present production, which will prevent the air lock condition from happening. Our current production oil screen and housing assembly is located more toward the front of the oil pan than the first type oil screen. It is recommended that the following procedure be performed during lubricare operation or when the oil filter element is being replaced. With oil element and lower housing removed, drill a 3/32″ diameter hole (no. 42 or 43 drill) into the outlet passage in the upper oil filter housing near the rib as indicated in Figure 5. CAUTION: When drilling through wall of cylindrical oil passage which is approximately 1/8″ thick, care should be exercised to prevent drill from entering opposite wall. 1953 or 1954 model affected by the serial numbers above, the 3/32″ diameter hole should be drilled prior to installation. During the normal course of lubricare operation, the time required to drill the prescribed hole is less than .1 hr. It is felt, however, that this additional .1 hr. should be charged to the owner since this work is for his protection in the event that he fails to replace his oil filter at regular intervals as recommended in the Owners’ Guide. A change has recently been made in production whereby the crankshaft oil baffle Gr. 1.430, Part No. 1161756 mounted on the bottom of the cylinder crankcase shown in Fig. 6, has been eliminated. Recently we have received reports that some new engines were overheating. It was found that the water passages under the timing change cover were blocked with metal casting flash as shown in Figure 7. These passages may be blocked completely or only enough to restrict the flow of water to a point where there is insufficient circulation to keep the cylinders cool. It is suggested that after all preliminary checks for engine overheating (i.e., radiator low on coolant, thermostat stuck, hose leaks, etc.) 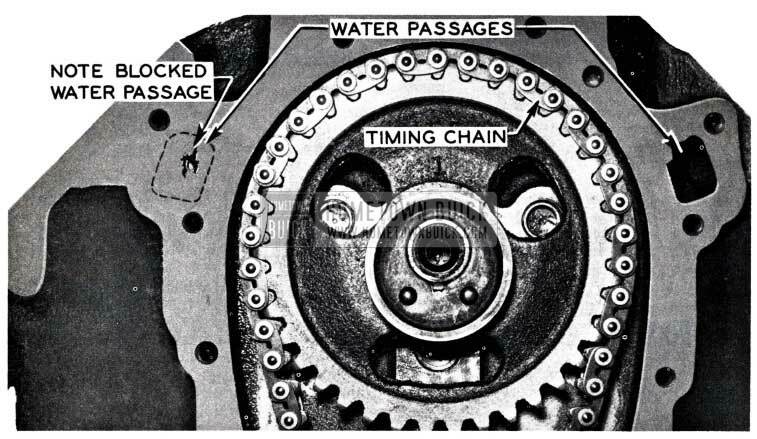 are made and the condition still exists, to remove the timing chain cover, and visually check the two water passages shown in Fig. 7. If one or both passages are restricted, use the timing chain cover gasket as a template by placing it against the block and mark the restricted opening. Then drill the opening to the size of the hole in the gasket. In B.P.S. 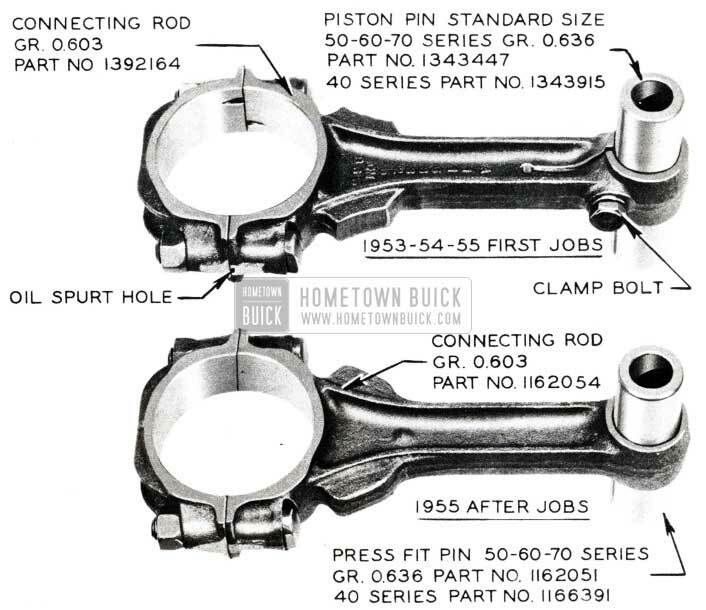 2388 dated May 6, 1955, an article instructed that in case of piston pin or any failure that involves replacing a pressed fit pin, the replacement would have to be of the old type connecting rod piston and pin assembly using the clamp bolt. This write-up will supersede that article. Listed below are the parts involved in this change and the interchangeability of these parts. Figure 8 shows the difference in the early and late type rod and pin assembly. Pistons 1953, 1954 and 1955. 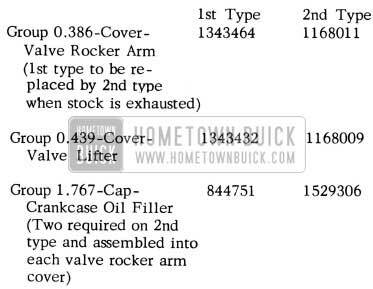 The pistons are interchangeable providing they are the correct year model. The only other precautions are that the pistons fit the cylinders and the wrist pin correctly. The type of piston pin and connecting rod makes no difference. Pistons will come with selected fit pins as they have been previously. (Piston pin must fit piston with an easy finger push fit at 70° F). Press-fit Piston Pins (Part Number 1162051) 50-60-70 Series. The pressed fit piston pins are produced in standard size only; there are no oversize pins as we have had previously. This pin can only be used with a press fit connecting rod. This is also true of 40 Series Press-fit Pins (Part Number 1166391). Clamp Bolt Piston Pin. The clamp bolt piston pin is easy to identify by the clamp bolt groove. This pin comes in three sizes standard, .003”, and .005” oversize diameters. The two oversize pins can only be used with a clamp bolt connecting rod. However, standard sized pins can be used in either type of connecting rod. Before installing a pin into a press-fit rod be sure to measure it with micrometers to determine that it is standard size. The reading must be .9394-.9397. It is obvious what damage could result from attempting to press an oversize pin into press-fit rods. Press-fit Connecting Rod (Part Number 1162054). This type rod may be used on any V -8 engine providing either a press-fit pin or a standard size clamp bolt pin is used. Clamp Bolt Connecting Rod. This type rod like the press-fit rod will fit any V -8 engine, but a clamp bolt piston pin must be used with it. When assembling the connecting rod, piston and piston pin assembly, the oil spurt holes in the bearing parting surface of the connecting rod must be on the same side as the valve clearance depressions on the piston head. The press-fit piston pin, connecting rod, and piston assembly requires the use of special tools for disassembly and assembly. 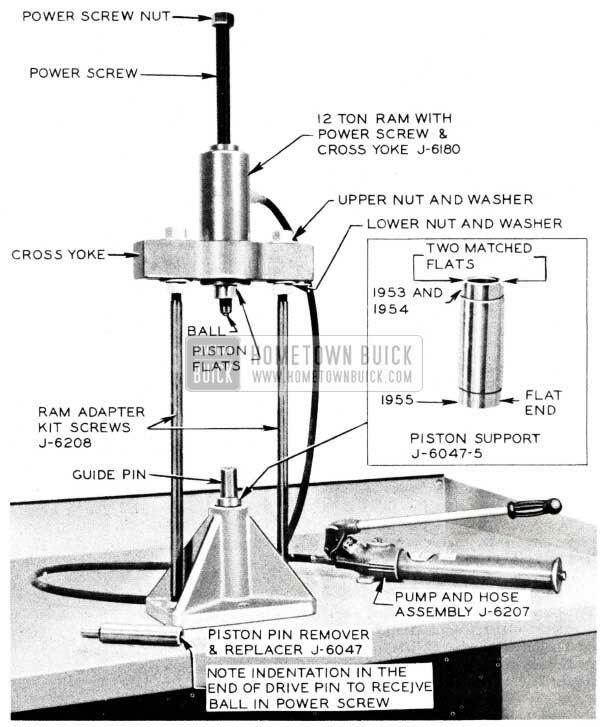 The piston pin remover and replacer, J -604 7, shown in Fig. 9 simplifies this operation without damage to the piston or rod. Thread the ram adapter kit screws, J-6208, short threaded end, into the base of the fixture. Place the ram, power screw, and yoke assembly on the adapter screws. Level the assembly by eye with the lower screw nuts so that it is parallel with the base. Connect the pump and hose assembly to the ram. 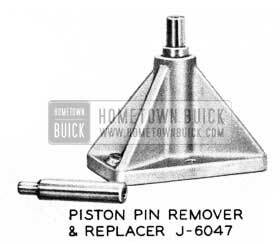 The Piston Pin Remover and Replacer, J -6047, consists of five parts. See Fig. 11. The base plate, J -6047-1, is sufficiently strong to handle the load required to disassemble and assemble the assembly. 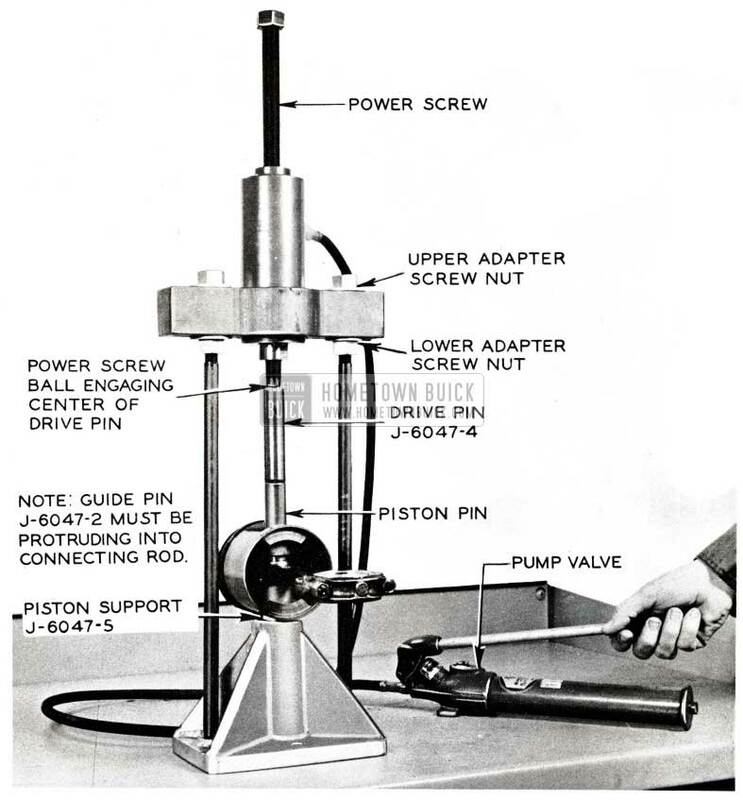 The piston support, J -604 7-5, See Fig. 10, is a double ended sleeve which is the only surface that supports the piston during the operations. The proper use of this sleeve is very important as it will prevent damage to the piston. 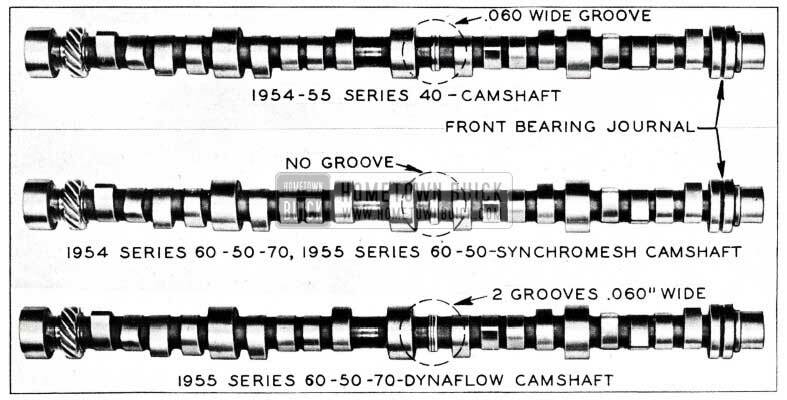 The flat end of the sleeve must be up to contact the piston when working on 1955 pistons. The end with the two machined flats must be up to contact the piston when working on 1954 and 1953 pistons. The return spring is designed to hold the guide pin in position and to return the guide pin and piston pin. The guide pin, J-6047-2, aligns the piston and rod. When the piston and rod are placed on the fixture, the return spring pushes the guide pin through the piston and part way into the rod. The guide pin is used only when pressing a pin into the assembly. The drive pin, J-6047-4, is used to transmit the force from the power ram to the piston pin without damage to the piston, rod or piston pin. The pin is of the proper diameter and length to clear all of the parts. To install a press fit pin, use the following steps See Figure 12. Place the piston support, J -6047-5, (Proper end up), the return spring, J-6047-3, and the guide pin, J-6047-2, into the base plate, J-6047-1. See Fig. 10 and 11 for proper assembly of tools. Place the piston and connecting rod on the fixture making sure that the guide pin protrudes into the connecting rod; also on 1953 and 1954 jobs make sure the flats on piston support J -6047-5 are up and positioned to provide clearance above and below the piston pin hole. Lubricate the outside of the pin and I D of small end of connecting rod with Lubriplate and push the pin into place by hand until it reaches the connecting rod. Place the drive pin, J -6047-4, into the piston pin. Thread the power screw down and shift the ram assembly until the power screw ball engages the center of the drive pin. Close the pump valve which is located on the right side of the pump; then using pump, apply enough pressure on the guide pin so that all of the parts seek their proper alignment. By adjusting the upper and lower adapter screw nuts, the ram power screw can be so positioned that it will be exerting a straight downward force on the piston pin. When the proper alignment is found, then tighten the adapter screw nuts to maintain this alignment for installing the remaining pins. NOTE: Apply and relieve pressure sufficient number of times to make certain there is no side thrust causing movement of the ram assembly. With the help of the pump, press the pin all the way in until the pin bottoms against the guide pin, J-6047-2, which in turn bottoms in the base plate. There is a slight difference in the depth that the pin should be pressed between the small and large piston, however, this is so slight that it may be ignored and all pins can be pressed to the same depth as determined by the fixture. After the pin has been pressed to its proper depth release the oil pressure by opening the pump valve. A spring in the ram will lift the ram piston. Be sure to hold the piston assembly as it will fall when the pump pressure is released. Rotate pin in piston to insure that fit was not damaged during assembly. Piston pin should rotate freely in piston at room temperature. To remove the press fit pin, use the following steps. See Figure 13. Leave the fixture set up as for pressing the pins in; however, remove the guide pin, J-6047-2, and place it on the bench. 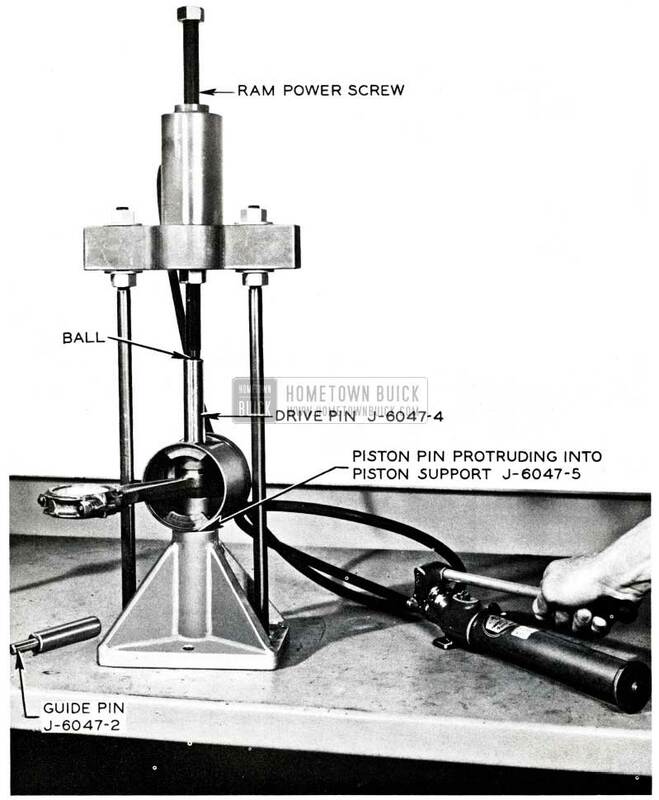 Slide the pin and rod assembly so that the pin protrudes through the piston. Place the piston assembly on the fixture so that the protruding pin is inside of the piston support, J -6047-5. Place the drive pin, J -6047-4, into the piston pin and thread the ram power screw down until the ball engages the center of the drive pin. Close the pump valve and force the piston pin out of the rod and piston assembly. After the piston pin has been forced clear of the rod, release the oil pressure and remove the piston and rod. The return spring, J-6047-3, will raise the piston pin out of the fixture so that it can be easily removed. This equipment may be obtained from the ”Kent Moore Organization, Inc.”; General Motors Building, Detroit 2, Michigan. Order blanks are available through your local zone office. The Parts Department will continue to supply both types of connecting rods until the stock of the clamp bolt connecting rods are exhausted; at which time only the press-fit type connecting rods will be serviced. The clamp bolt type piston pins will continue to be serviced in the various sizes. Press fit and clamp type rods may be mixed in an engine assembly, as they are both balanced to the same specifications. 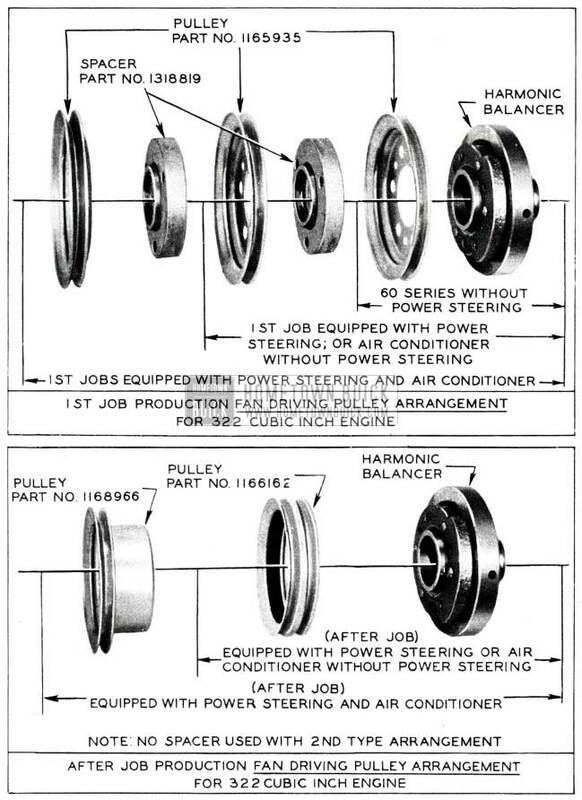 Because of the many possible arrangements of existing fan driving (crankshaft) pulleys and fan driven (engine fan) pulleys for both 1st and after production jobs, the following information was prepared to explain the after job change, how and what pulleys are used with each 1st and after production job, and also to explain how the after job pulley change affected the air conditioner field installation packages. The information presented is somewhat complex; however, every effort was made to make description of the various pulley applications as simple as possible. Newly designed solid double groove fan driving (crankshaft) pulley and a new solid double groove fan driven (engine fan) pulley have gone into production as an after job change which affects only power steering and air conditioned jobs. See Figure 14 and 15. Various applications of the new type pulleys are shown in Figures 14&15. 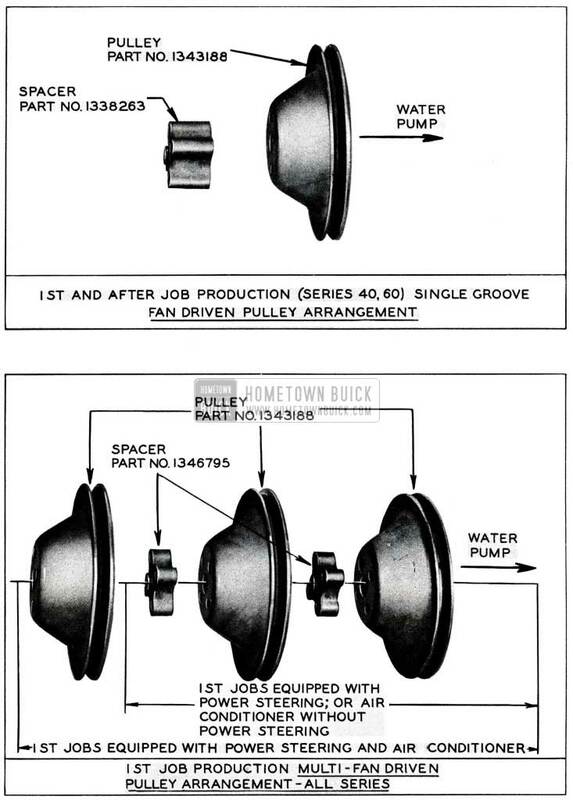 Figure l shows a comparison between first and after job production of the fan driving pulleys on a 322 cu. in. engine whereas Figure 15 shows after job fan driven pulleys arrangement. NOTE: No spacers are used between pulleys with the after job arrangement. Since the advent of the new solid double groove pulleys, the air conditioner field installation packages have been changed accordingly w include the new type pulleys. 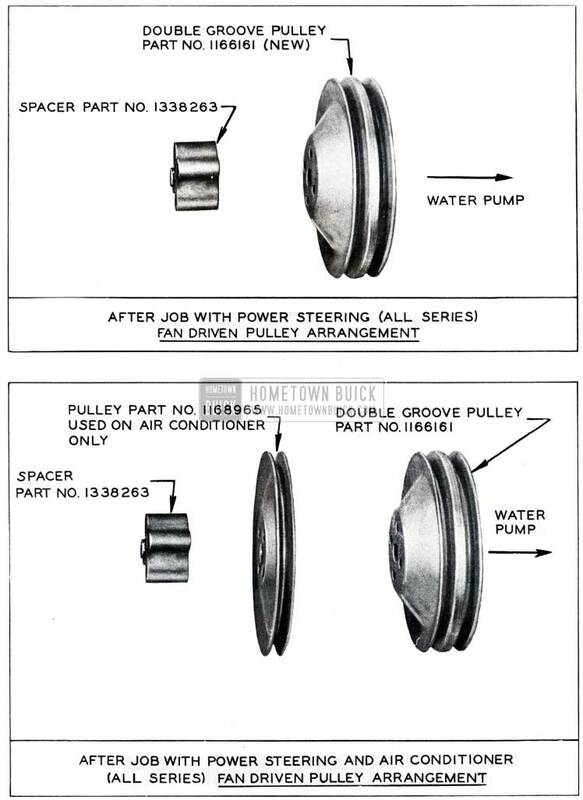 The use of the standard single groove fan driven pulleys used on Series 40 and 60, not equipped with power steering or air conditioner, will be continued as in the past. 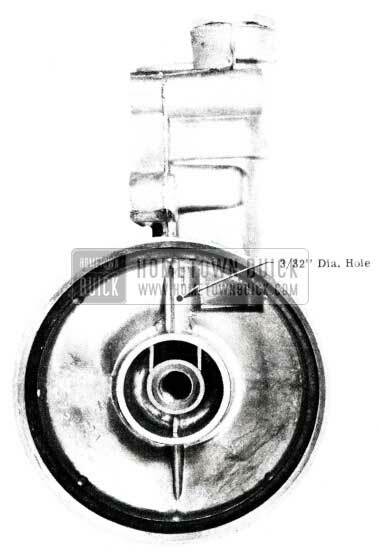 The use of single, double, and triple groove cast iron fan driving pulleys will also be continued on Series 40 engines. All Air Conditioner packages shipped from the factory up to approximately April 15th will contain the first type pulleys; all packages shipped thereafter will have the after- job pulleys. In order to properly adapt the 1st type air conditioner package on an after job car and vice-versa, the following information must be observed. 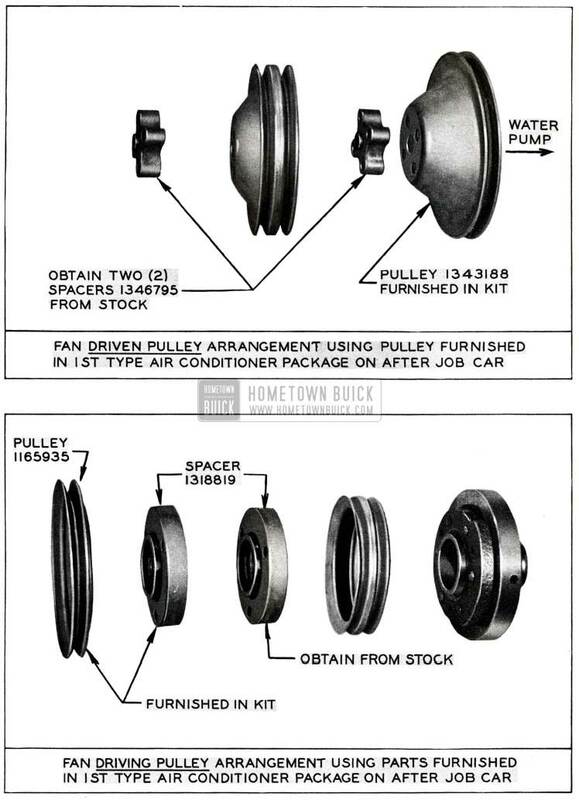 First type air conditioner packages contain the necessary pulleys and spacers to convert a 1st job production car for a 1st type air conditioner pulley arrangement as shown in Fig. 14 and 16. In the event that the 1st type air conditioner package is to be installed on an after job production car, the pulley arrangements shown in Figure 17 may be used; however, additional spacers must be obtained from stock, as indicated, in order to properly position the pulleys in alignment with air conditioner compressor. After job air conditioner packages will contain a complete set of fan driving and fan driven pulleys; therefore, this package is applicable to either first jobs or after jobs by merely installing pulleys, furnished in package in the arrangement shown in Figure 14 and 15.